The third grade reading level is widely recognized as a key indicator of a child’s future educational success. A student who can’t read on grade level by third grade is four times less likely to graduate than a child who does read proficiently in third grade. [i] Add poverty to the mix, and a student is 13 times less likely to graduate on time than his or her proficient, wealthier peer. 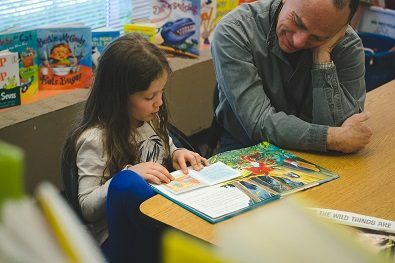 [ii] According to the 2016-17 Oregon Smarter Balanced Assessment, 55 percent of Oregon third-graders did not meet state reading standards. Research proves that shared book reading and the availability of books in the home during a child’s first, formative years are the strongest predictors of early literacy skills. SMART provides both. SMART acknowledges that deep racial, cultural, social, and economic inequities in our country and state make it harder for some children to succeed than others. We launched our Equity Initiative in 2014 to address the fact that children need different support to reach the same outcome and meet or exceed the third-grade reading benchmark. To learn more about SMART’s commitment to equity, click here. SMART offers a variety of program delivery models to accommodate a diverse set of educational needs and environments. [i] Double Jeopardy: How Third-grade Reading Skills and Poverty Influence High School Graduation. Annie E. Casey Foundation, 2011. [ii] Double Jeopardy: How Third-grade Reading Skills and Poverty Influence High School Graduation. Annie E. Casey Foundation, 2011.